The Jaguar Land Rover has taken a step ahead in the auto world by presenting new version of its high- end Range Rover SV Autobiography 2016. With the very unveil of 2016 SV Autobiography at this year’s New York International Motor Show in the United States, the analysts and enthusiasts seemed much focused on the generally called term, ‘extraordinary luxury SUV’. 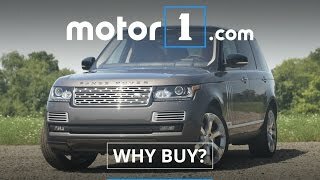 Question arises what it is that makes the new Jaguar Range Rover Autobiography 2016 a sensational luxurious SUV in this highly competitive market, where there had already been expectations from Bentley and Rolls Royce. 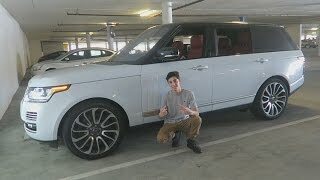 Though there isn’t much shared about the specifications but we’ll take you to a little more depth and will see and analyze as to what Range Rover Autobiography has inside for its buyers. The Range Rover SV Autobiography comes with a powerful supercharged five-Liter V8 Engine, subsequently developing a 543 bhp of horsepower and torque of 502 lb-ft. We can say that the above mentioned power is equivalent to five ford fiestas. So here is one out of those many things which makes the New Land Rover Range Rover SV Autobiography 2016 an amorous beast in autoworld. This power in fact takes an off-roader to a top speed of 150mph and why not after all, the engine so used is one which is mostly found in the Italian super cars. According to the figures shared, the SV autobiography will take you to 60mph in 5.5 seconds. 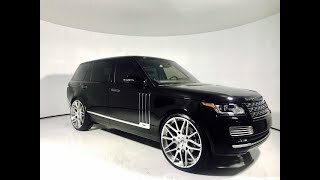 Upon this we feel a little conservative as a usual short wheel base Range Rover can you to same in 4.7 seconds, while the top speed knocks at 140mph. Talking about the cabin and comfort inside, the company seemed to have worked out well in the interior of Range Rover SV Autobiography. This also includes the startup sound and rotary controls, indeed machined from solid aluminum to form knurled details. At the back section you’ll notice comparatively chill compartment, deployable tables and metal coat hooks, toad to your luxurious ride. The rear seat entertainment screens and a 29 speaker 1700 watt Meridian sound system accompanied well by the 20 way power front seats, four zone climate control and adaptive cruise control, makes the ride memorable. Apart from these the rear seat also features, beverage cooler, deep-pile mohair mats and an optional aluminum sliding load floor, which is to bring the cargo area to you. This all no doubts make the Interior are worth beholding. The Exterior in all gives you a strong body with the looks of a beast adored with formal clothing. Yes we literally mean it, as this is what was the first thought that knocked our head upon seeing this newly released Range Rover SV Autobiography 2016. The Land Range Rover SV Autobiography 2016 with all its commendable features, very well keeps it at the price of Euro 148,900 and for its US customers it’ll be $ 84,490. As far as the release date is concerned, till date there isn’t any announcement from the company’s side, however talking about speculations, the model is expected to hit the market by somewhere in mid of 2016.